The global carrier specially designed its A321-type aircraft with a livery of the ‘Trojan Horse’ image after the Republic of Turkey Ministry of Culture and Tourism announced 2018 as “The Year of Troia”. Dubai, United Arab Emirates -- May 12th, 2018: Following the Republic of Turkey Ministry of Culture and Tourism announced 2018 as “The Year of Troia”, that coincides with the 20th anniversary of the admission of the archaeological site of Troia to UNESCO's World Cultural Heritage List, various introductory activities continue to be conducted on a global scale to promote the region during the whole year. Turkish Airlines, flies to 302 destinations in 121 countries as the only airline reaches to more international flight points in the world, supports to the promotion activities of “The Year of Troia” with its 'Troia” themed aircraft. 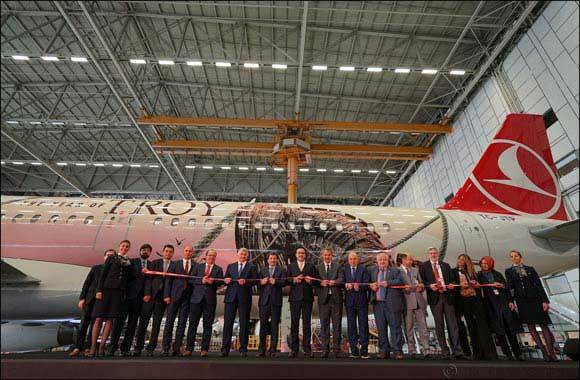 This aircraft, that introduced to the press with a special event in the Hangar of Turkish Technic Inc., will contribute to the promotion of the “The Year of Troia” through its worldwide flights. “As the flag carrier airline of Turkey, we place great importance on promoting our country and our values. The Trojan, which dates back to 3000 BC, is one of the unique civilizations of Anatolia with its history that was the subject of many epics. We’re honoured to contribute to the introduction of “Troia” with our Troia themed aircraft at many worldwide destinations that we serve. We’re inviting the global community to see 'Troia”, and to our fascinating country which hosts many more epics such as “Troia” in its rich history.” said M. İlker Aycı, Turkish Airlines Chairman of the Board and the Executive Committee, in his speech at the launch ceremony.